This tour has become an annual member favorite! Grab your tickets now because this event will sell out quickly. Mixology class with Yes Cocktail Co. Your ticket includes luxury transportation, both breakfast AND lunch, tastings and tours at all stops and a mixology class with Yes Cocktail Co. This is great for both networking and client appreciation. 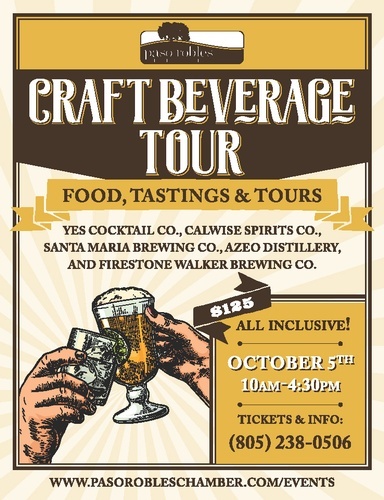 Stops include Santa Maria Brewing Co., Azeo Distillery, Calwise Spirits, Yes Cocktail Co. and Firestone Walker Brewing Co.